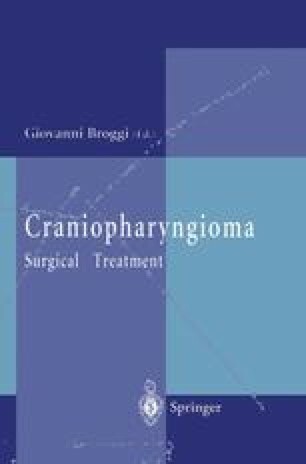 Craniopharyngiomas are histologically benign tumors of maldevelopmental origin, occurring mainly in the intra- and suprasellar regions. These neoplasms arise from epithelial remnants of squamous cells of Rathke’s pouch stomodeal epithelium. Craniopharyngiomas represent 2.5%-3% of all intracranial tumors. About 50% of them occur in childhood. These tumors may be predominantly cystic (with no significant solid portion), mixed (cystic and solid components), or predominantly solid. The fluid in the cysts varies but is usually brownish, containing cholesterol crystals. In all cases craniopharyngiomas have a stratified squamous epithelium resting on a collagenous basement membrane.